Amanda Taylor talks about our work on a national government-led pilot scheme for ZeroC in Basingstoke. Custom- and self-build housing has long been a central source of housing delivery in other parts of the world, particularly continental Europe. Until recently, self- and custom-build has been largely overlooked as a mainstream (or in some cases, viable) source of housing delivery in the UK. This is not to say it isn’t attractive or desired – far from it. Many factors have been holding back the growth of this market, including the reliance on volume housebuilders in the industry and difficulties in accessing land, finance and skills amongst would-be self- and custom-builders. As a national government-led initiative, the HCA’s piloting of Specifi in Basingstoke presents an opportunity to discover ways of overcoming those barriers and proving this is a viable and powerful model of housing delivery. Specifi will play an important role in kick-starting the self- and custom-build revolution in the UK. In recent months, we have been working with client ZeroC, developers for the Specifi site, on an application for 122 new dwellings at the 5ha site. The aim is to build a place that feels familiar and safe for residents with attractive streets and a central green space to play on. Specifi is a pioneering project in the construction and delivery of these houses, which will be evident in subtle changes in the frontages of individual dwellings. The proposed homes will be traditional in form including terraces, semi-detached and detached dwellings and two apartment blocks. The homes will be constructed using timber frames, then finished with red brick or dark weather boarding to reflect traditional barns and housing in Basingstoke. A range of internal layouts will be available to residents and this will influence the external appearance of the dwellings. 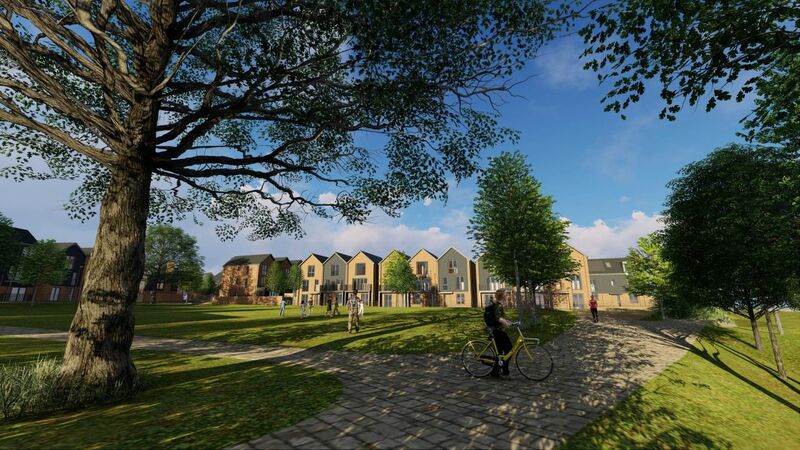 The terraced streets will be lively and characterful as residents make individual choices for their homes. The pallet of materials and the scale and form of buildings will be consistent, helping to tie the whole terraced elevation together. The occasional bay, dormer or floor to ceiling window will bring variety to the elevations while the mix of window sizes and add-ons will give the streets their unique character. Six self-build plots have been provided and will create a distinctive cluster on the site. The shape of the buildings, materials, and window sizes have been suggested in a plot data sheet and for planning purposes, potential floor plans and elevation have been suggested. However, the residents are free from there to design it themselves. The open market housing on the site will be built using custom-build principles and is available for purchasers to invest in up front, through a mortgage provision offered by the developer, although purchasers are, of course, at liberty to provide their own funding or seek alternative mortgage provision. All ‘for sale’ units will have a number of internal layouts to choose from, including the option to increase the number of beds from either 2 to 3, or 3 to 4 depending on the unit type. These increases will be in the form of converted space in the roof and estimates of conversions have guided elements such as the parking provision. The custom-build process is a different experience for buyers. They will need support during the design process and the ability to ‘shop’ at home to configure their perfect place. An interactive website is being developed to help them through the sales and choice procedures as quickly and efficiently as possible. We are looking forward to continuing our work on this important national pilot scheme to provide a well-designed, attractive environment with access to a range of open spaces for all.